Texas Southern University Testing Center (UTC) is committed to providing quality test services to its clientele. Please click on the link next to the test you would like to take to find out about testing details. The University Testing Center (UTC) provides institutional and national examinations to students and non-students in an environment that enables examinees to perform to the best of their abilities. Our testing environment embodies test administration practices which (1) adhere to nationally recognized professional testing standards and government regulations, (2) maintain the integrity of the testing performance by incorporating ethical standards and security measures, and (3) treat all examinees in a professional, yet personable manner. The Texas Southern University Testing Center adheres to the Standards and Guidelines of the National College Testing Association. 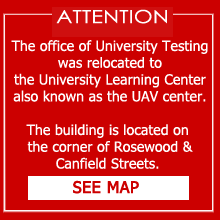 The University Testing Center (UTC) is located in the University Learning Center, formerly known as the Urban Academic Village (UAV) Center, located on the corner of Rosewood & Canfield streets. Parking is available in the East Side Parking Garage, on the corner of Tierwester & Cleburne streets. The entrance of the parking garage is on Tierwester Street; the cost is $3.00 daily (cash or credit card). On the day of your scheduled test, you are required to bring an unexpired driver’s license or state ID as primary identification; it must include your name, date of birth, signature, and contain a recognizable photograph. Personal items are NOT permitted in the testing center this includes, but is not limited to: food, beverages, gum, candy, cellphones and other electronic devices. Our lockers are available on a limited basis. Scratch paper, calculators, and No. 2 pencils will be provided if required for testing. Primary IIdentification: Current government-issued Driver’s License or State ID, which must include your name, date-of-birth and signature with a recognizable photograph. Personal Items are NOT permitted in the testing environment: This may include but is not limited to the following: food, beverages, gum, candy, mobile and/or other electronic devices. Items Provided by Testing administration: Scratch paper, calculators and No. 2 pencils, if required for examination. Lockers are available while in the testing environment.